This parrot with its subdued but beautiful coloring occurs only in small areas of semi-arid tropical grassland with scattered trees. Here it feeds on the ground, eating mainly the seeds of native grasses, but also taking other seeds, and sometimes blossoms and buds. Birds take to the trees when alarmed and also rest in the branches in the hottest hours of the day. 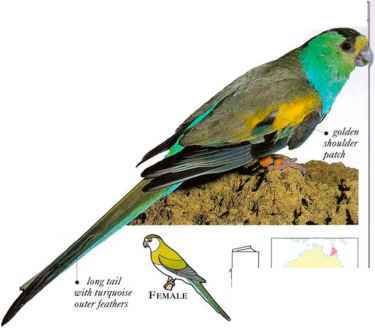 The Golden-shouldered Parrot has a rapid, undulating flight. • NEST A tunnel and nest chambcr are excavated in a tall termite mound on the ground, preferably standing in water. The termites then seal the inner walls. • DISTRIBUTION Grassland areas of Cape York Peninsula in N.E. Australia. • REMARK This species is now seriously endangered owing to the illegal collection of birds for the live bird trade. Numbers had already dwindled, probably because of the introduction of grazing cattle, which ate the native grasses. A stocky and short-tailed parrot, this bird occurs in lowland forest and mangroves, where it feeds on seeds, nuts, and oil palm fruits. 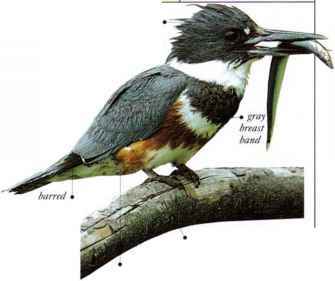 It lives mainly in the trees, occasionally coming to the ground to feed on maize crops and to obtain grit, which it requires to digest grain. Flight is fast, direct, and high. Birds are noisy, with screeching and whistling calls. • NliST An unlined hole high in a tree. • Distribution Tropical w. Africa, the Zaire basin, and N. Angola. 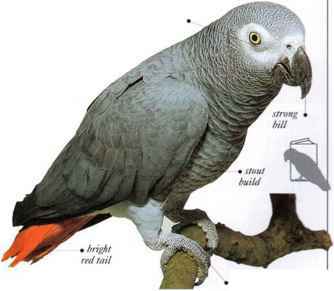 • REMARK Because these birds breed well in captivity and are easily taught to "talk," they arc-popular in the pet trade.